Chelsea has never had it easier. We are the experts for garage storage in Chelsea. Cutting Edge Garage Solutions is ready to help you with any of your needs for garage storage in Chelsea. 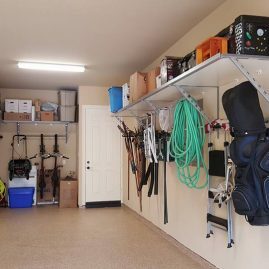 We provide the whole nine yards, from overhead garage storage and garage shelving to garage flooring and garage cabinets. We are sure to Turn your garage into a thing of beauty. Our products and services are here to help you solve your storage problems and get the most out of your storage space. We offer Monkey Bars Garage Storage Systems, the best garage storage Chelsea has ever seen. 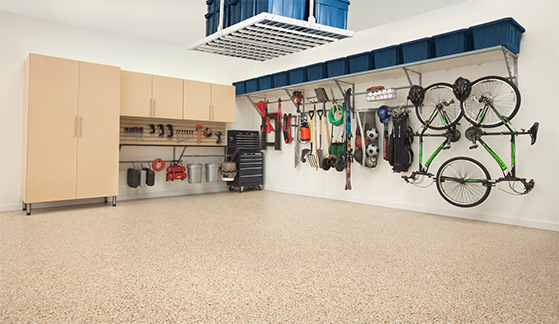 Efficient Storage: Our systems maximize on available space to help you get the most out of your garage. We store less frequently used items up high out of the way and more frequently used items down low for easy access. Custom: We know that everyone has different storage needs and budgets. That’s why our systems are custom designed to meet your storage needs, available space and desired budget. Budget Friendly: Our customers are happy to discover they actually spend half as much as they would with another storage system on the market. 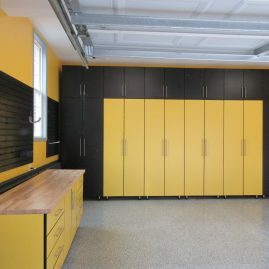 Garage Cabinets: Select from a wide variety of sizes and colors of cabinets to store things up and out of sight. Garage Flooring: With one of our beautiful, custom garage floor coatings, you will be the envy of the neighborhood.